Interesting selection to spend some time swimming in Hyères. Is it not your first time here? Tell us how it went using the Facebook comments below or contacting us directly! 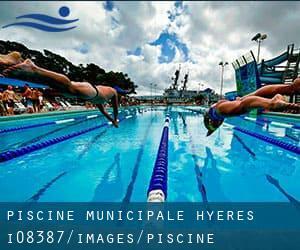 Piscine Municipale - Hyeres is only one of all the swimming pools Swimia is providing you, and its knowledge has been shared with us by a swimmer like you.Keep in mind it is possible to now promote Piscine Municipale - Hyeres by sharing this page with your good friends, adding comments and linking to us. This sports center delivers 25 meters x 12.5 meters, 5 lanes, Indoors. For this Swimming Pool, only phone number is number here. Updated on 2019 Rue du Marechal Lyautey , Quartier Gallieni , Frejus , FRANCE (Postal Code: 83600). Swimmers like you reported 25 meters x 10 meters, 4 lanes, Indoors. Unfortunately we do not have the email address of this Pool, but we can provide you with the phone number. Updated on 2019 31 Avenue des Oliviers , Sillans la Cascade , FRANCE (Postal Code: 83690). Swimmers like you reported 25 meters x 10 meters, 4 lanes, Indoors. Unfortunately we do not have the e-mail address of this Swimming Pool, but we can give you the phone number. Updated on 2019 Avenue Alphonse Daudet , Draguignan , FRANCE (Postal Code: 83300). Among all the activities offered by the center, should you be keen on swimming you will enjoy 25 meters x 12.5 meters, 5 lanes, Indoors. If you will need to contact this Pool, email address and phone number are both number. Updated on 2019 Avenue Leon Blum , Draguignan , FRANCE (Postal Code: 83300). Swimmers like you reported 25 meters x 15 meters, 6 lanes, Indoors. Phone number and e-mail address are number for this Pool. Avenue de la Palasse , Quartier Font Pré , Toulon , FRANCE (Postal Code: 83100). This sports center provides 25 meters, Indoors. For this Swimming Pool, only phone number is number here. Updated on 2019 1196, Boulevard de la Mer , La Base Nature , Frejus , FRANCE (Postal Code: 83600). This sports center delivers 25 meters x 10 meters, Indoors. For this Swimming Pool, only phone number is number here. Updated on 2019 Avenue du Port de Plaisance , Quartier Port Marchand , Toulon , FRANCE (Postal Code: 83000). This sports center offers 25 meters x 10 meters, 4 lanes, Indoors. For this Swimming Pool, only phone number is number here. 432, avenue de Rome , La Seyne sur Mer , FRANCE (Postal Code: 83500). Among all of the activities supplied by the center, should you be enthusiastic about swimming you might take pleasure in 25 meters x 15 meters, 6 lanes, Indoors. If you must contact this Swimming Pool, e-mail address and phone number are both number. Updated on 2019 Avenue de l´Europe , Saint Raphael , FRANCE (Postal Code: 83700). Few days ago a regular user of this center told us they offer Olympic size, 8 lanes, Indoors. Furthermore, they keep in good conditions 25 meters, 4 lanes, Indoors. Contact information for this Swimming Pool which include phone number and email address are number. Boulevard des Cretes , La Grande Bastide , Gassin , FRANCE (Postal Code: 83580). This sports center offers 25 meters, Outdoors. Contact data for this Pool such as phone number and email address are number. Chemin de la Repentance , Six Fours les Plages , FRANCE (Postal Code: 83140). Among all of the activities offered by the center, for anyone who is considering swimming you may get pleasure from 25 meters x 10 meters, 4 lanes, Indoors. Just in case you want to get in touch with this Swimming Pool before dropping by, we only know the phone number. Updated on 2019 Route Salins , Saint Tropez , FRANCE (Postal Code: 83990). Among all the activities offered by the center, when you are interested in swimming you will enjoy 25 meters x 10 meters, 4 lanes, Indoors. Just in case you desire to contact this Pool before dropping by, we only know the phone number. Updated on 2019 Chemin Coudouliere , Six Fours les Plages , FRANCE (Postal Code: 83140). Swimmers like you reported 25 meters x 10 meters, 4 lanes, Indoor/Outdoor. Unfortunately we do not have the e-mail address of this Swimming Pool, but we can give you the phone number. 163 Chemin Moneiret , Quartier Quatre Chemins des Routes , Toulon , FRANCE (Postal Code: 83200). Swimmers like you reported 25 meters x 12.5 meters, 5 lanes, Indoors. Unfortunately we do not have the email address of this Pool, but we can provide you with the phone number.